Image seam carving is an algorithm for content-aware image resizing invented by Shai Avidan and Ariel Shamir (http://www.faculty.idc.ac.il/arik/). The method takes content of the resized image into account and removes least significant pixels first. Picture Resizer 3.0 uses combination of classic image resampling and image carving to change both size and aspect ratio of a picture and preserve as much of the original as possible while filling the whole destination rectangle. The need to adjust aspect ratio of wallpapers was the main motivation for the addition of the retargeting function in Picture Resizer 3.0. While digital cameras usually have a 4:3 aspect ratio, LCD displays use another ones, like 5:4, 8:5 or 16:9. 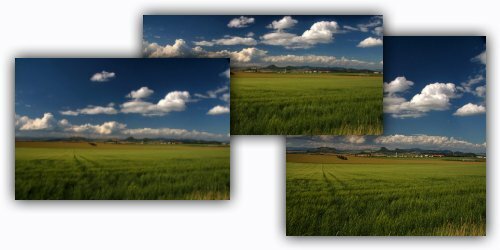 PhotoResize.exe can adjust your photos for your display. Just let it know your wishes and pray. Image aspect ratio was changed. Note that the clouds appear to have been moved rather than distorted. PhotoResizeG1024x768.exe - 14", 15" displays. PhotoResizeG1280x1024.exe - 17", 19" displays. PhotoResizeG1600x1200.exe - 19" and larger displays. PhotoResizeG1680x1050.exe - 19" and larger displays (wide screen). If you are not sure, what resolution is your display using, look up the display properties in Control Panel. Your internet browser states that your screen resolution is: pixels. Get Picture Resizer from the main page. It is a batch processor and one failed image is not considered a critical error. It just prints an error message on the screen and continues. Error is only returned if the parameters on command line are wrong. Images are by default created in the same folder, but it can be overridden by the -c with a template of the destination file path and name. "Error occured while processing: C:\XAMPP\xampp\htdocs\EcosExpo\img\news\resizeme\546afffc.jpg"
But although I specify "-if" it always resizes everything. How can I do this? the full condition must be used, for example: "-if X<Y"
how do I rename the image output? is it possible to copy images smaller than specified resize dimensions to the target folder with the others instead of skipping?